A view of the North side of the Arch from South-bound 5th Avenue. 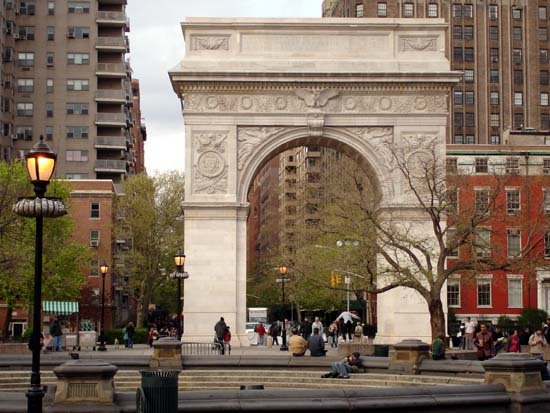 The Washington Square Arch is a tribute by the City of New York to George Washington, the first President of United States. 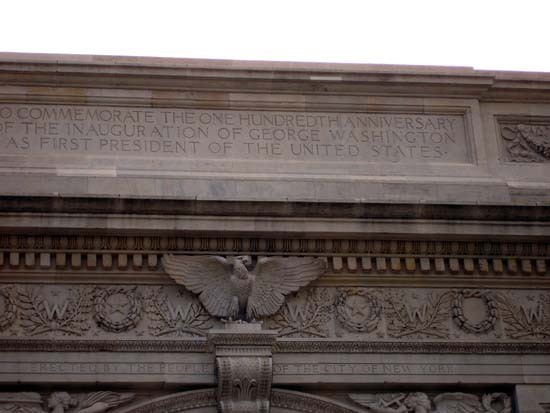 This tribute was in the form of a wooden Memorial Arch to commemorate the Centennial of Washington's inauguration as President of the United States. The celebration took place on April 30, 1889. 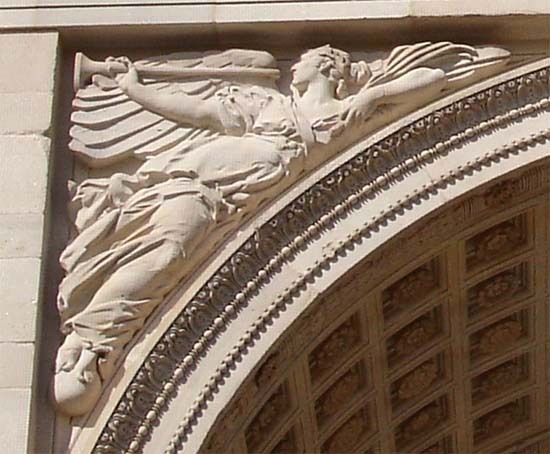 The arch, designed by Stanford White and modeled after the larger Arc de Triomphe in Paris was so successful at the celebrations, that a marble version was commissioned. 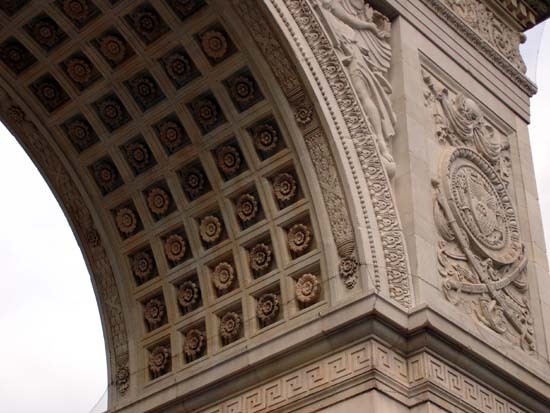 The Washington Arch is located at 5th Avenue and Waverly place. This view shows the south side of the Arch. In May 1895 the final version of the 77 ft (23,4m) Washington Arch was inaugurated. The pier sculptures of Washington (viewed from North side) as general and president were added in 1916 and 1918 respectively. 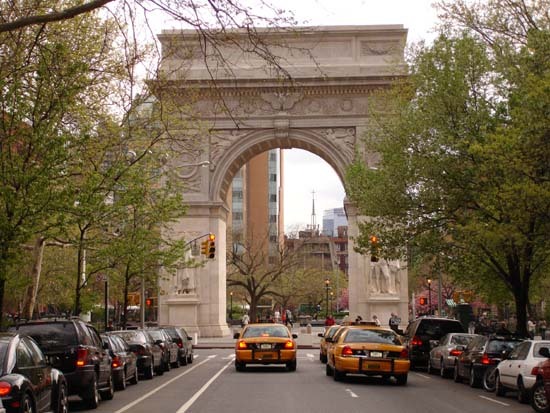 The Washington Square Park (foreground) is bounded by Waverly Place, 4th street, University Place and MacDougal Street. To the left when facing the Arch from the North side, the sculpture depicts George Washington as Commander-in-Chief, accompanied by Fame and Valor. It was designed by Hermon Atkins MacNeil and installed in 1916. 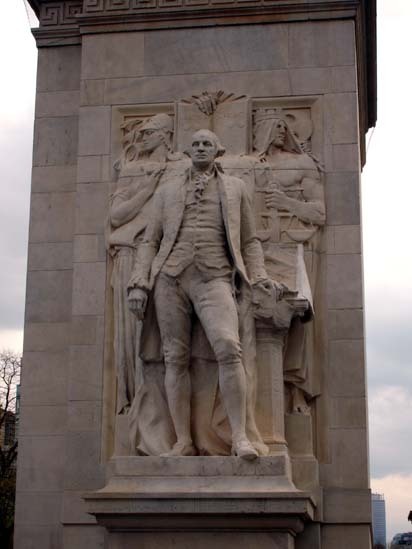 The sculpture of Washington is 16-foot high and shows him with hands resting on the pommel of an unsheathed sword. 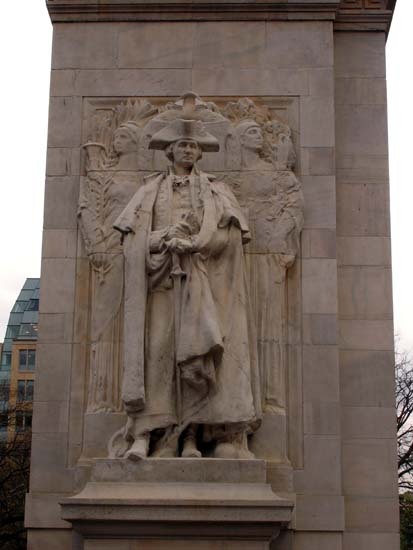 To the right (when facing from North side), the 16 feet tall sculpture of Washington depicts him as Statesman, accompanied by Wisdom and Justice. This sculpture was designed by Alexander Stirling Calder and installed in 1918. "To commemorate the One Hundredth Anniversary of the inauguration of George Washington as first President of the United States. A close up of the Eagle below the inscription. 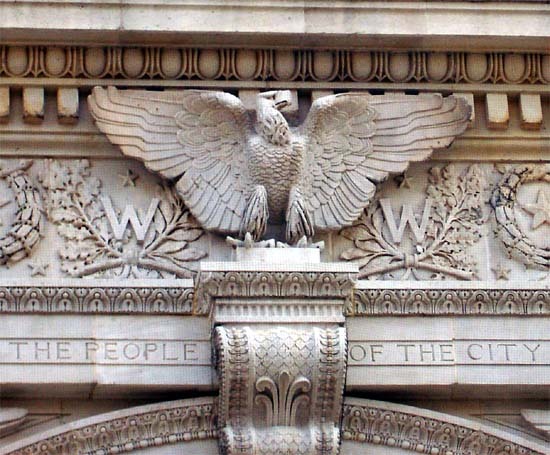 The line below (North side) fully reads: "Erected by the people of the City of New York". A close up of the arch from the South side. 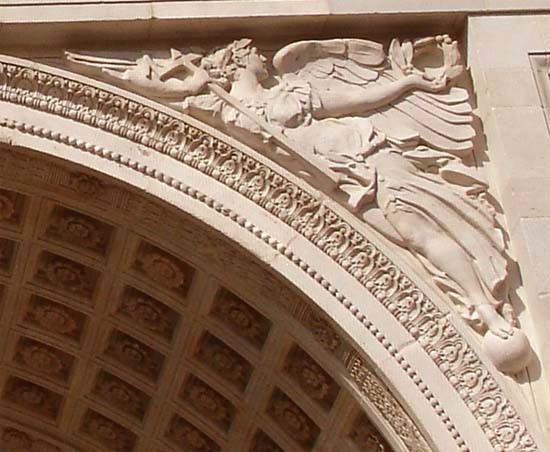 Another close up of the arch from the South side highlighting the figurines – symbolizing art and beauty – that is sculpted on the left and ride sides of both, north and south sides of the Arch. 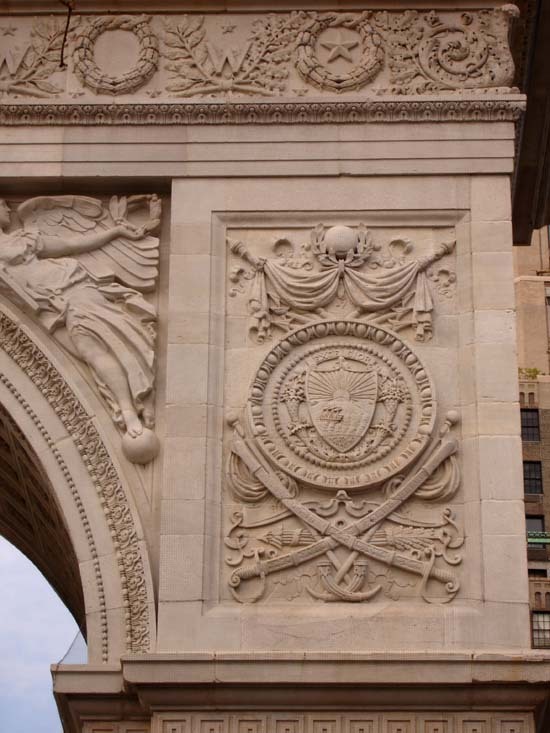 A close up of the insignia incorporating the "President's Seal" as viewed from the South side of the Arch. 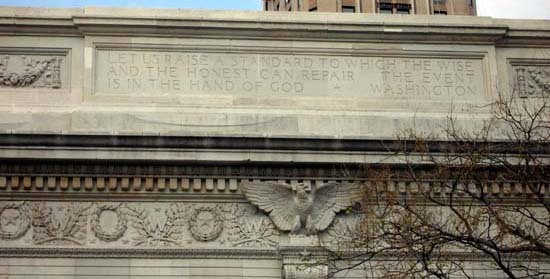 The inscription on the South side of the Arch is a quote by George Washington which reads: "Let us raise a standard to which the wise and the honest can repair. The event in the hand of God.... Washington." 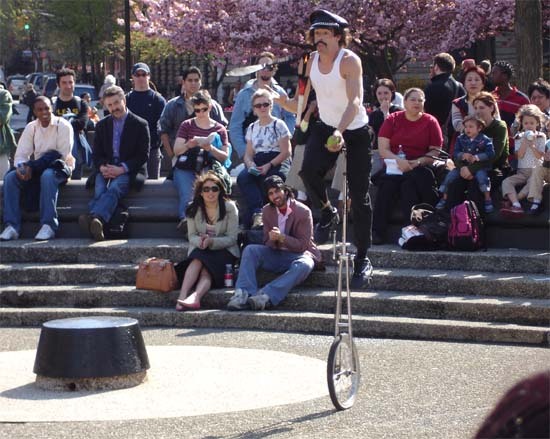 The next picture taken on April 26, 2005 shows 'entertainment' in the Washington Square park. This is the 'fountain' area of the Washington Square park which is totally spread in an area of almost 10 acres. Today when this picture was taken, the fountain was still not operative and instead the area was being used by this juggler entertaining the visitors.